That hole punch is very much needed in my life! 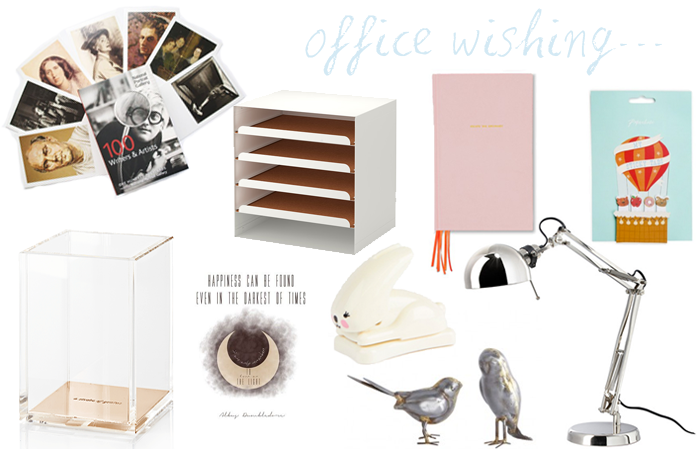 Love this, really into adorable pieces for the office right now. You have just introduced me to Kate Spade homeware- amazing! I want it all! That bunny hole punch is too cute! I'm going to see if I can find it at Paperchase tomorrow! I do like a clean office space, I think tidy room tidy mind! That bunny hole punch is so cute! I really want one of those Kate Spade notebooks too. They look just perfect, although I think I'd be too scared of ruining it to use it! Love the pen holder and could really do with one of these letter trays for my desk at work! That bunny hole punch is too cute!! Sooo cute! Need it all! really like the idea of the artists and writers in a box, might be good for a christmas present this year!